This entry was posted in LSU C.virginica Oil Spill MBD BS Sequencing and tagged Crassostrea virginica, Eastern oyster, GenBank, HB16, HB2, HB30, NB11, NB3, NB6, oil, SRA on 12 April, 2018 by kubu4. 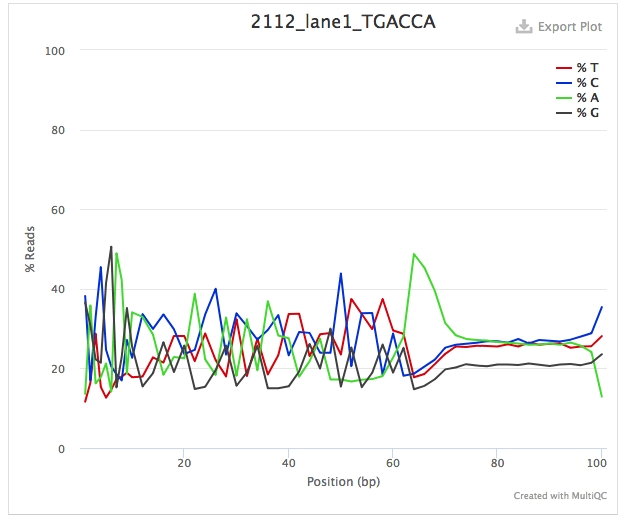 This entry was posted in LSU C.virginica Oil Spill MBD BS Sequencing and tagged BS-seq, Crassostrea virginica, Eastern oyster, FASTQC, ipython notebook, jupyter notebook, MBD-Seq, NGS sequencing, oil, Trimmomatic on 15 April, 2015 by kubu4. Compared total amount of data (in gigabytes) generated from each index. The commands below send the output of the ‘ls -l’ command to awk. Awk sums the file sizes, found in the 5th field ($5) of the ‘ls -l’ command, then prints the sum, divided by 1024^3 to convert from bytes to gigabytes. This entry was posted in LSU C.virginica Oil Spill MBD BS Sequencing and tagged BS-seq, Crassostrea virginica, Eastern oyster, FASTQC, LSU, MBD-Seq, NGS sequencing, oil on 13 April, 2015 by kubu4. This entry was posted in LSU C.virginica Oil Spill MBD BS Sequencing and tagged BS-seq, Crassostrea virginica, Eastern oyster, LSU, MBD-Seq, NGS sequencing, oil on 13 April, 2015 by kubu4.